The lighting today shows how the fabric looks different at different angles …the triangles are all rotated so the straight of grain ends up on the outside edge of the hexagon. With the rotation the weave is in different orientations and makes for the variation in colors . A few days before Easter I entered a drawing on Facebook. The random drawing was a few days ago and I won! 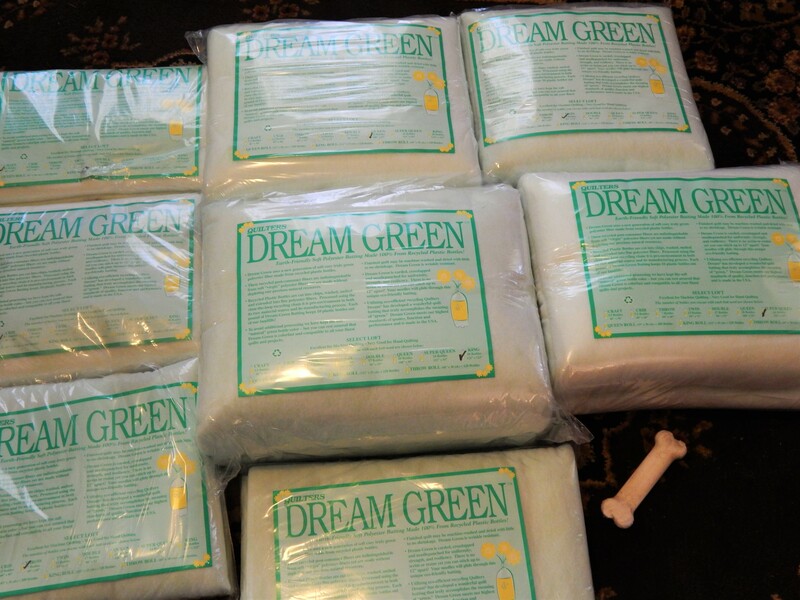 A case of Dream Green Batting. Fed Ex delivered it yesterday. 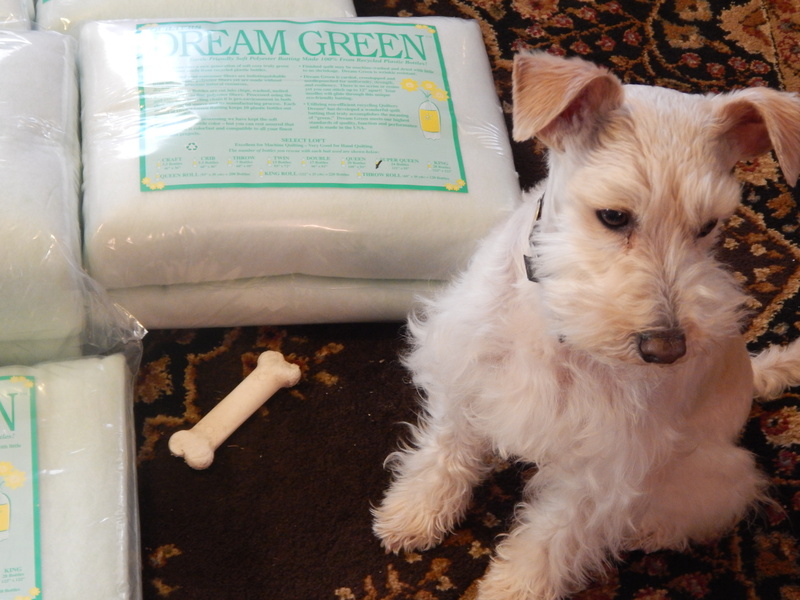 Thank you Quilters Dream! One of these will go in the top I just finished. Teddy had guard his bone so I wouldn’t put batting on top. This entry was posted in Quilts and tagged peppered cotton, Quilters Dream, Quilting, Quilts. Congrats on your win! Beautiful quilt!!!! That case of batting couldn’t go to a better home. Look forward to seeing how you put it to use. Wow!! Great win! You will use this up in no time! Love your new top! A case…. they have your ticket!!! A case…. would last most of us a year…. 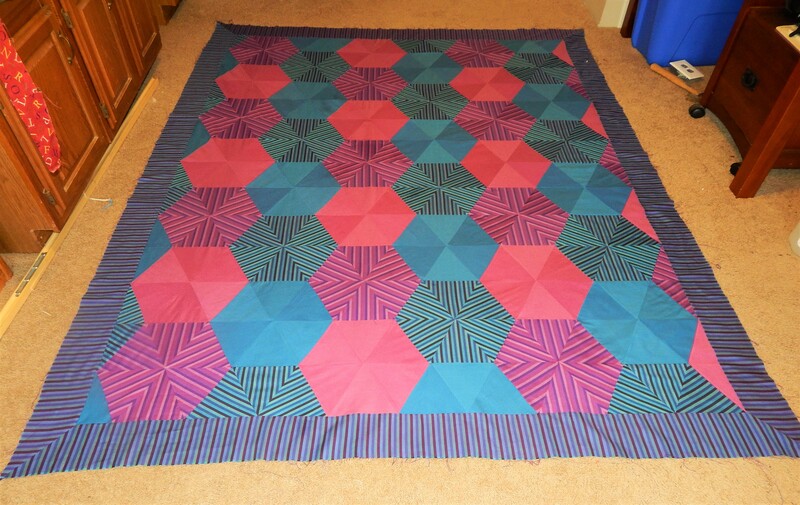 interesting fabric you used in this quilt. Good golly, you are fast! Beautiful job with the Peppered cottons! Love that fabric! I think you’re going to go blind quilting that one, either by hand or machine! It looks wonderful, and so does all that batting. Great use of stripes. And Teddy is SO CUTE! You deserve to win that batting – good for you! I really like your peppered stripes. It’s amazing how the values change with the lighting. I like how the stripes match up. Great job!